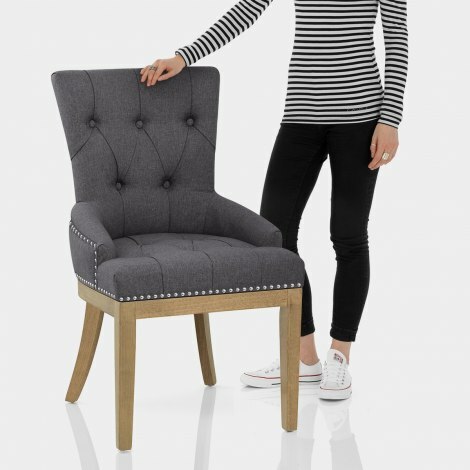 An incredibly stylish design with ornate features, the Knightsbridge Oak Dining Chair Charcoal Fabric is a gorgeous addition to the dining area. 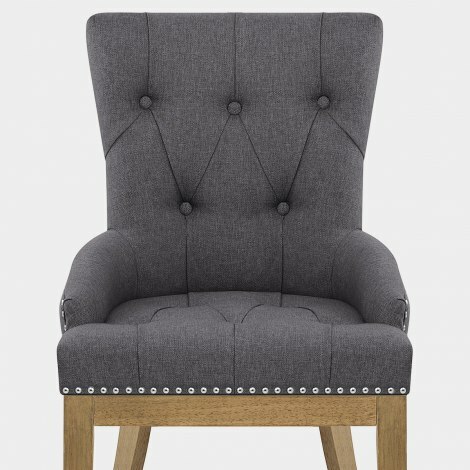 With beautiful button detail adorning the charcoal fabric seat, this design makes a real focal point. In addition, metal studs add to this ornate look. For comfort, the seat is equipped with a belted frame that makes for a sumptuous experience. A classic solid wooden frame sits below and edges the underside of the seat. The four legs have a divine oak finish to match many interior settings. Finally, the legs are complete with a set of protective floor plugs.